A pet lending library (yes, that it just what it sounds like) is perhaps not the most prestigious place for a college graduate to work, but then again, it wasn’t all the great being an ice cream-scooper or gift-wrapper either. Not only is our unnamed protagonist stuck in the deadest of dead end jobs, but her relationship with her live-in boyfriend (read: the guy she mooches off of) is somewhat sub-par as well. But, while she’s not really happy, she’s also not motivated enough to change anything about how she is living – until she reads Robert Louis Stevenson’s Treasure Island. Never has a book had such a deep and immediate impact on a reader as Treasure Island has on her, that it is life-changing is not even hyperbole. Armed with what she sees as the books Core Values of boldness, resolution, independence, and horn-blowing, our unnamed protagonist is now ready to take on the world with hilarious results that are both predictable (to the reader) and unexpected (to her). 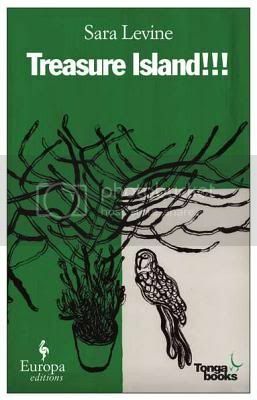 Never has a book been so poorly interpreted as Stevenson’s Treasure Island is by the narrator of Levine’s Treasure Island!!!. Her assessment of the Core Values may not be too far off, but her method of attempting to live them out is, frankly, bizarre, and generally involves taking little to no responsibility for her actions. Now, none of this is in any way meant to be a criticism of Levine’s Treasure Island!! !, she has actually created a wryly story about an incredibly misguided and socially inept girl who completely misses the point of what she considers to be incredibly transformational literature. Levine’s Treasure Island!!! is fun and funny, and may make you wonder if you have ever completely missed the point of a book. If you’re interested in Levine’s process and how she came to write Treasure Island!! !, check out our interview with her on What’s Old is New. The past few years in particular have seen a plethora of Jane Austen retellings and adaptations. Many of these adaptations are beloved almost as much as Austen’s original stories are. It is gratifying to see an author who has been dead nearly 200 years inspiring such love and devotion that an entire subgenre has developed out of her work. Laurel Ann Nattress, a lover both of Austen’s original books and the “Austenesque” novels, decided to bring together some of the very best authors in the Austenesuqe subgenre – as well as some other authors who have been heavily influenced by Austen’s work – for a collection of original short stories: Jane Austen Made Me Do It. Sometimes I’m not sure if there has ever been a review written of a short story collection that does not include the word “uneven.” Unfortunately, there are few short story collections that manage to avoid needing such a designation. That reality becomes particularly obvious when the collection is pulled together from the stories of twenty-two different authors. With the exception of Brenna Aubrey, a new writer whose story was included after she won the Jane Austen Made Me Do It short story contest, most of the featured authors are beloved in their genres. However, though they are incredibly well-respected, these authors are primarily novelists, and many of them did not transition well into the short story form. The second story in particular, Waiting, read as if it were a scene from a novel, rather than a story in its own right. Waiting stood out the most for this issue, but it was evident in other stories to a lesser degree as well. Interestingly, Aubrey’s story, the one submitted through the short story contest, was one of the best. Certainly, though, there are bright spots in Jane Austen Made Me Do It, in addition to simply Aubrey’s story. Lauren Willig and Jo Beverley’s stories stand out in particular. The casual fan of Austenesque stories might do better to pick a novel by one of these generally esteemed writers, but die hard fans will find enough to love in Jane Austen Made Me Do It that it is worth buying. Recently Nicole and I read The Scarlet Pimpernel for a classics rip episode of What’s Old is New. Now, this isn’t the first time that I had read – or blogged about, for that matter – The Scarlet Pimpernel. Almost three and a half years ago, I read Baroness Orczy’s book alongside Lauren Willig’s flower spy series (as an aside, how is that I have blog posts that are almost 3.5 years old?!?) and I thoroughly enjoyed it. Still, even though it was a relatively recent read, I was afraid that The Scarlet Pimpernel might not hold up, since I’ve probably read 600 books since then. 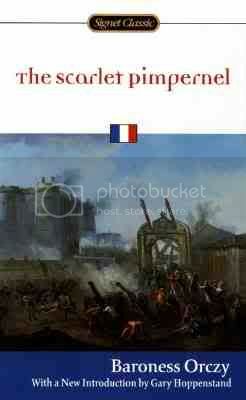 What I found was that I loved The Scarlet Pimpernel just as much as I did three years ago. As a classic action adventure novel it is an inordinate amount of fun. There are the requisite misunderstandings and thwarted love affairs, dashing heroes rescuing people from certain death, and a villain readers will love to hate. Of course, nobody is going to be super surprised that I enjoyed The Scarlet Pimpernel since I loved it three years ago and suggested it for this classics rip episode. Nicole was a skeptic, though, and only really agreed to read it at all because I told her it was very short. If you want to know if she liked it too, though, you’ll have to listen to the episode. By the way, in this episode we also announced a contest for the first person who can recommend to us a Dickens book we actually both like. If you have suggestions, please add them to the comments on the episode.